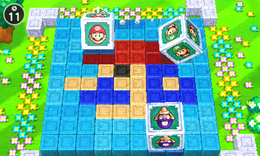 Squared Away is a 1-vs-3 minigame found in Mario Party 5. Its name is a play on the expression "squared away", used to refer to one who is skilled and ready to accomplish their tasks. It returns in Mario Party: The Top 100. Mario Party 5's version contains several different aesthetics: Mario, Heart, Star, but Mario Party: The Top 100's version has only Mario. Unlike in Mario Party 5, the lone character in Mario Party: The 100 vocalizes when getting crushed. 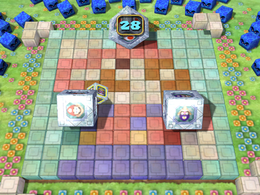 The tiles for the grid drop down on the board while the solo player stands on a block in the upper left corner. All the blocks drop down; three big ones and one small one. The solo player jumps into the small one and the minigame begins. The solo player must avoid being crushed by the team players. The team players can cover 4 tiles, which is more than the solo player (which is only 1 per roll), with each roll, but to counter this disadvantage, the solo player moves much more quickly than the team players. 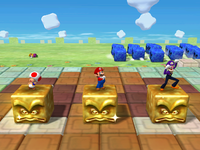 In Mario Party 5, depending on whoever wins, the loser(s) will be chased by Thwomps in the background and trip while the winner(s) perform their victory pose on top of a golden Thwomp. Rules – "Three players each climb into a giant cube and try to squish the fourth player, who's trying to escape in a smaller cube." Advice 1 – "The player in the smaller cube should make tight turns to escape the giant boxes." Advice 2 – "The three players in the giant cubes should cooperate and try to corner the fourth player." Description – "Who will win? One small, nimble cube, or 3 huge, lumbering ones? Either way, it will be a crushing victory!" On-screen (Solo) – "Don't get crushed!" On-screen (Team) – "Crush the small box!" This page was last edited on February 3, 2019, at 20:22.